Like many fantasy writers, I typically predict the most likely outcomes. After all, having reasonable and grounded expectations for players is usually the best way to construct solid rankings and build productive rosters. But once in a while, an owner needs to step outside the box, go with their gut, and put their name on some bold predictions. Here are 10 predictions for 2019 that I see as possible — even if they are a bit of a reach. Berrios was heading into ace territory last season before running out of steam. Don’t believe me? Check out his monthly ERA stats – 1.56, 1.85, 2.56, 2.56, 4.74, 4.71. The right-hander clearly wore down during his final starts, as his control improvements eroded. But Berrios is going to finish the job this time by posting a low-3.00’s ERA and collecting 220 whiffs. Rosario already owns the contact skills to post a high batting average, and his wheels are good enough to log a double-digit steals total. To get to the next level, the outfielder simply needs to produce a few more homers by maintaining his fly-ball rate gains and enjoying an improvement on his mediocre 12.0 percent HR/FB rate from 2018. He also could reach triple-digit totals in runs scored and RBIs simply by hitting in the heart of an upgraded Twins lineup. Guerrero will debut on April 23 and take baseball fans on a fun ride for more than five months en route to leading the American League with a .325 batting average. 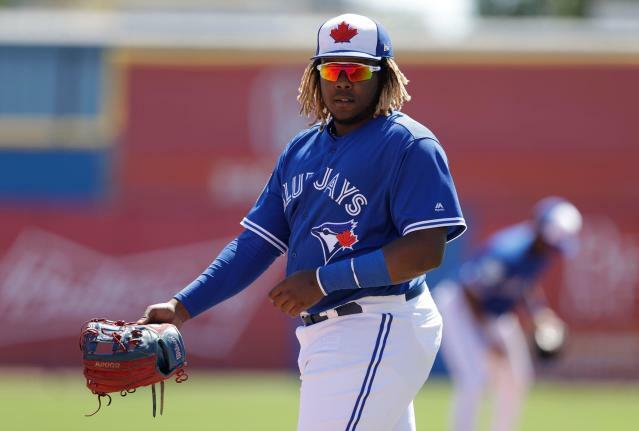 After hitting .381 with 37 walks and 38 whiffs last season, the recently-turned 20 year old clearly has the plate skills to hit the ground running with Toronto. Even with the negative impact of his off-field troubles, Osuna fared fine when eligible to pitch last season. And a look at his career numbers (2.78 ERA, 0.92 WHIP, 6.3 K:BB ratio), clearly shows that the 24 year old is among the best closers in the game. Osuna is going to lead the Majors in saves this season and establish himself as Houston’s best closer since Billy Wagner. I get it … Gabe Kapler is cool. He has big biceps and shredded abs, and he is part of a new breed of managers who understand how to creatively manage bullpens. But Gabe — nicknamed The Body on his Baseball Reference page — hasn’t followed fantasy baseball for as long as I have! And years of playing this game has taught me that managers generally revert to using a lone ninth-inning man, even after they make noise about sharing the role. Kap didn’t have an experienced closer last season, but he does know. And after Robertson shares a couple April save chances with Seranthony Dominguez, he will win over his new manager and amass 40 saves on a contending Phillies club. Mondesi is all the rage right now, but his enticing combination of power and speed could be held in check by a dismal batting eye (career 0.14 BB:K ratio). Owners in 10-team leagues who waste a high pick on the 23 year old are going to be evaluating their waiver wire options by the All-Star break. With a 10.0 K/9 rate across the past two seasons, Rodriguez already has the swing-and-miss skills to collect 200 strikeouts. But tallying innings has been a big problem for the lefty, as injuries (primarily knee troubles) have prevented him from topping the 140-frame mark. The 25 year old is going to enjoy improved health this year, toss 180 innings, reach the 200-whiff plateau and make a massive impact on the rotations of those who tab him in the middle rounds of mixed-league drafts. The Dodgers typically do their best to limit their starters’ innings, and this year will be no exception. Clayton Kershaw and Rich Hill are already injured, Hyun-Jin Ryu is a walking band-aid and Kenta Maeda has been far from durable since coming to America. This team is one Walker Buehler injury from having a quintet of sub 150-inning starters, and a Buehler ailment in his first full Major League season would not be surprising. Overall, owners should be wary of making major investments in this group. The better plan may be the use late-round picks on replacement starters such as Ross Stripling and Julio Urias. Overshadowed by fellow rookies such as Guerrero and Eloy Jimenez, Senzel is about to become a serious fantasy force. The youngster will open the season in the Minors but should join the Reds at some point in April. The expectations here are for Senzel to hit .280 and approach 20-20 status. Posey could lead all catchers in batting average, but his expected 2019 average is likely closer to .280 than his lofty early career marks. And a .280 average will not be enough to make up the ground he will lose on his more powerful position-mates when he posts a single-digit homer total. Hitting in a lackluster Giants lineup will be the final nail in the coffin when this former fantasy superstar falls to waivers in some one-catcher leagues.